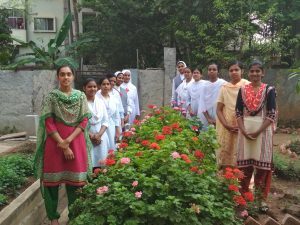 The girls who are interested to join with the Daughters of St. Camillus, come together from the different states of India and doing their first initial studies here. They are also given the opportunity to experience the Charism and Apostolate proper to the Institute through the guidance and selfless service of four sisters. To bear witness to Christ through serving the poor and down trodden and to foster local vocation, in the year 1990, the Daughters of St. Camillus opened their first house in Andhra Pradesh with a Dispensary and an Aspirant’s house in Janampet, Eluru Diocese, with the love and concern which Christ showed towards the sick and the poor. The dispensary is functioning daily and nearly 30 patients receives medical benefits each day.